The Anderton Boat Lift is an incredible edifice, perched on the banks of the River Weaver like some giant three-storey-high iron spider. Built by Edwin Clark in 1875, the Anderton Boat Lift conveys cargo boats 50 feet vertically from the River Weaver to the Trent & Mersey Canal. The feat of engineering is astonishing though the idea is simple: two gigantic water tanks with watertight sealable doors carry boats up and down. The original counter-balanced system was replaced in 1908 by electric operation, but the lift now works hydraulically again. 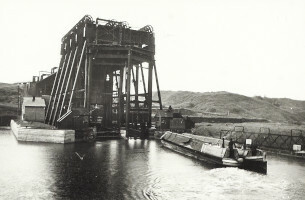 The lift worked until 1983 when serious deterioration of the structure was discovered. £7m was raised to fund the restoration, which was completed in 2002.